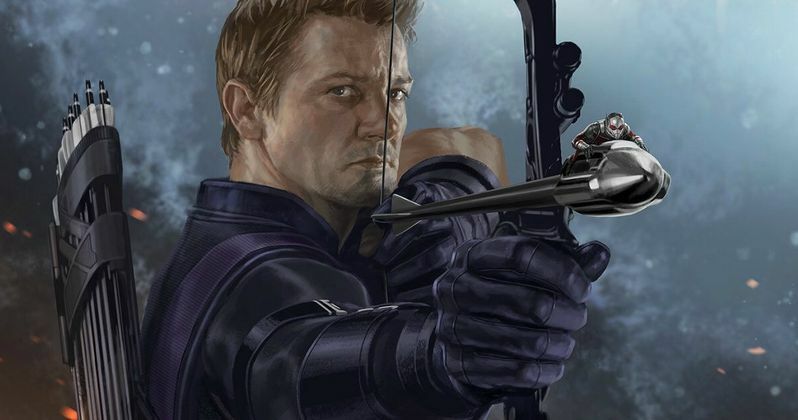 Hawkeye to Return in Ant-Man 2? While promoting his hit sci-fi film Arrival last year, Jeremy Renner was asked if his commitments to Avengers: Infinity War would interfere with returning as Brandt in Mission: Impossible 6. Since the production schedules for both movies seemed to overlap, the actor wasn't exactly sure how it would all shake out, but it seems that there is also another project that will now definitely keep the actor away from Mission: Impossible 6. A new report claims that, not only is Jeremy Renner shooting Avengers: Infinity War, but he'll also be gearing up to return as Hawkeye in Ant-Man and the Wasp. This new report comes from Showbiz 411, which reveals that Jeremy Renner will shoot both Avengers 3 and Ant-Man 2 back-to-back. Filming is already under way on Avengers Infinity War, which will also be shot back-to-back with Avengers 4, with the entire shoot slated to stretch until sometime this fall. In between this massive shoot, we reported in January that Ant-Man 2 starts filming this June in Atlanta, which is one of the locations Avengers: Infinity War is filming in, along with the U.K. and an upcoming New York City shoot happening in May. Jeremy Renner's return as Hawkeye in Ant-Man and the Wasp makes sense, since Hawkeye and Ant-Man were both on Team Cap in last year's Captain America: Civil War. They both also teamed up for one of that movie's most memorable moments, when the miniscule Ant-Man hitched a ride on the tip of one of Hawkeye's arrows, during the massive airport fight scene. Whether or not we see a repeat of that scene remains to be seen, especially since very little has been revealed about the Ant-Man 2 story, except that Paul Rudd will be back as Scott Lang/Ant-Man, and Evangeline Lilly will also be back as Hope Van Dyne/The Wasp. While there have been reports that Michael Pena will be back as Luis, the actor revealed earlier this month, while promoting CHiPs, that he hasn't been asked to return, and he's not sure if he will be back. Michael Douglas has also been confirmed to return as Hank Pym, although none of the other Ant-Man stars have been confirmed at this time. While no other cast members have been confirmed yet, a profile on actress Sharon Stone last summer revealed that she has signed on for an unspecified role in a Marvel movie, which speculation immediately surfacing that she's playing Hope Van Dyne's mother, Janet Van Dyne, who was trapped in the Quantum Realm and believed to be dead, since no one had ever escaped from the Quantum Realm, until Scott Lang managed to do so at the end of 2015's Ant-Man. Marvel traditionally releases a full cast list when most of its movies start production, although that didn't happen when Avengers: Infinity War began filming, most likely because the cast is said to be quite enormous. Still, pre-production is under way, and filming starting in just a few months, we'll hopefully be getting some details about who will be joining this superhero sequel soon. Peyton Reed is returning to direct Ant-Man and the Wasp, working from a script that was co-written by star Paul Rudd and the writing team of Gabriel Ferrari and Andrew Barrer. Although they didn't receive screenplay credit, Gabriel Ferrari and Andrew Barrer served as the production writers, working on the script for six months while Ant-Man was in principal photography. Ant-Man and the Wasp has been set for release on July 6, 2018, which currently has the date all to itself, although it is situated between the untitled Purge sequel on July 4 and four new movies on July 13, Universal's Skyscraper, New Line's The Nun, Sony's Hotel Transylvania 3 and Paramount's Amusement Park.